sign in for trip leaving tomorrow will be 7am. 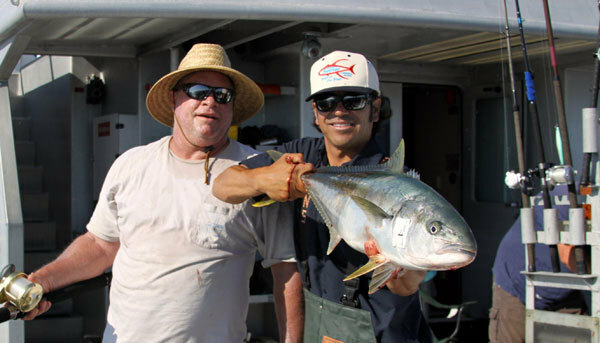 "Today was as good as it gets on yellowtail fishing," noted Independence skipper Jeff DeBuys July 6. "Everything was the hot ticket, as there was something for everyone today. Bait, lures, all lures worked. The hot sunny weather made for a really spectacular day. We are going to try something different for tomorrow." 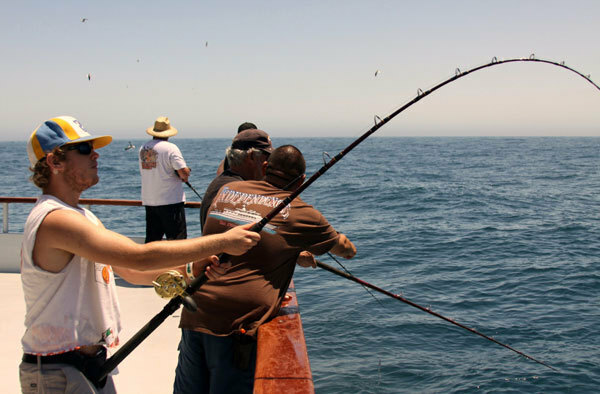 The Indy will arrive at Point Loma Sportfishing at 6am on Saturday 7/9/11, sign in for the Tahoe Tuna Club 7am..
Pete Gray's Let's Talk Hookup five-day trip aboard Independence returned to Pt. 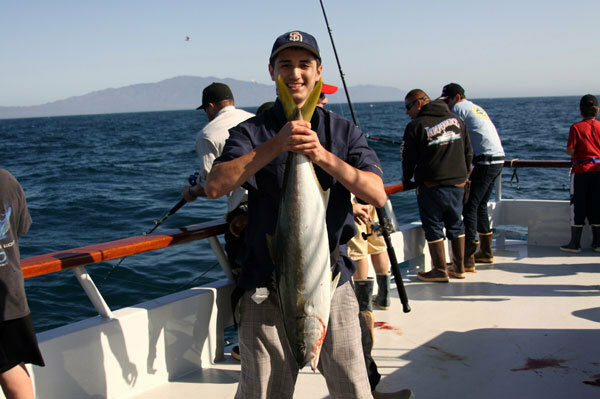 Loma Sportfishing July 9 with a mixed catch of bluefin, yellowtail and other species. 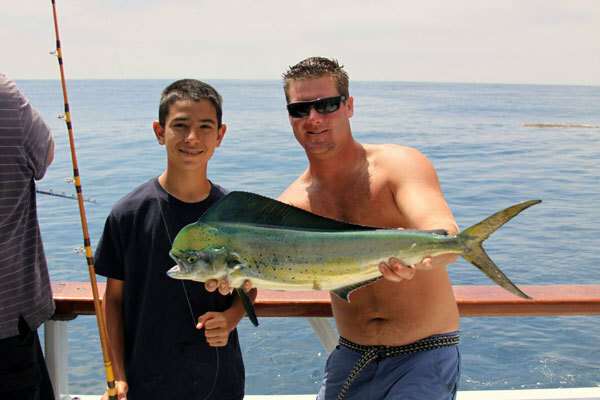 Jeff DeBuys skippered the trip, and he called it, "Off the charts coastal fishing." 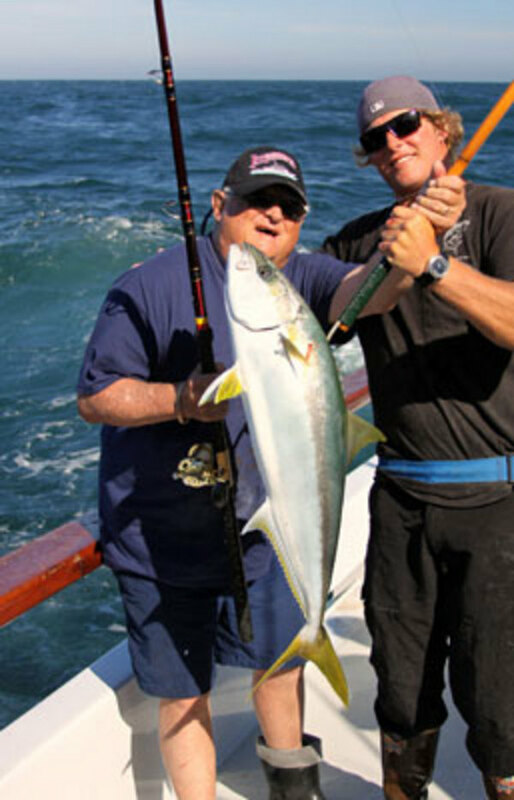 Pete Gray said, "It was the best yellowtail bite I ever saw." 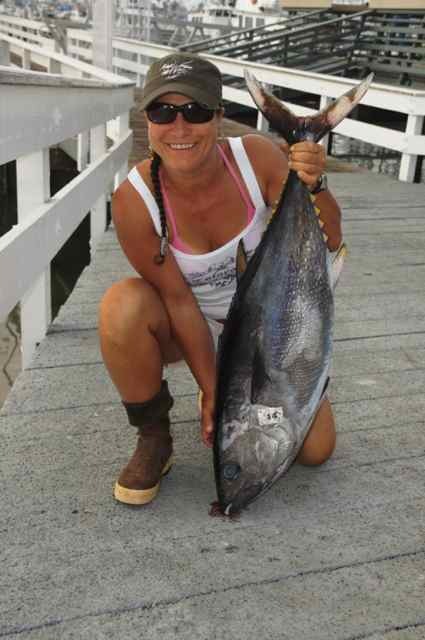 Valerie Otero of Boulder, CO won first place for her 34.6-pound yellowtail. 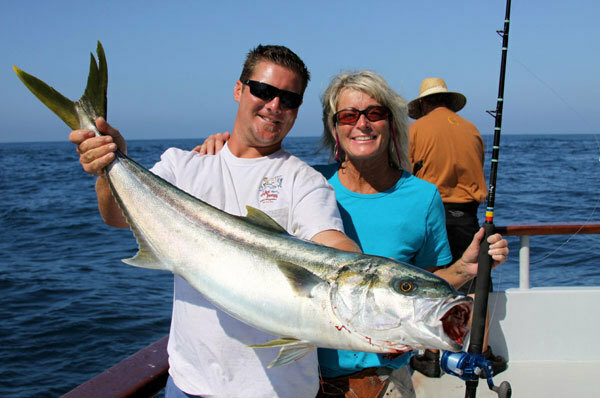 She said it bit on a sardine and a 2/0 ringed Mustad Hoodlum hook on 30-pound Seaguar Premier fluorocarbon and 50-pound Izorline spectra on an Okuma Andros reel and a six-foot Super Seeker rod. 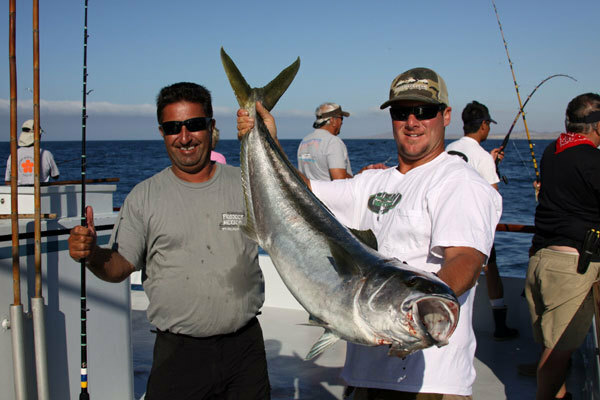 Darrell Hansen won second place for a 33-pound bluefin and Greg Kuno tied him with an identical fish. 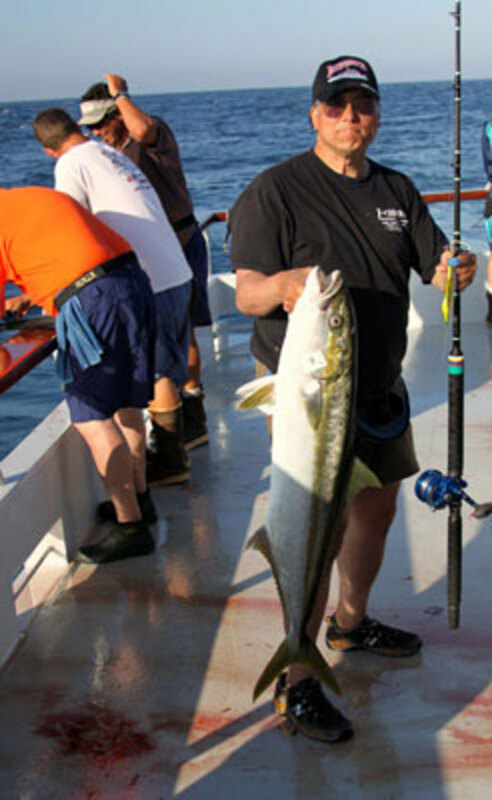 Hello everyone, we returned from our let's talk hook-up trip with host Pete Gray as charter master. First, thanks to everyone who made the trip this year and hope to see all of you soon. The begun's for the trip are as follows: 1st place Valerie Otero from Colorado with a 34.6 Bluefin, 2nd place was a tie goes to Darrell Hanson and Greg Kuno with 33.0 Bluefins. We are now back on the road again with very good weather and a fair forecast for the next few days. This is a 7-day trip with the Tahoe tuna club and we are headed south and plan to start on the Rosa bank looking for that nice Yellowfin that's been around lately. Wish us lots of luck, The Indy Crew. Judy Collins in the Independence office tells us that our trip aboard the boat is nearly sold out. Only two spots remained as of last weekend. 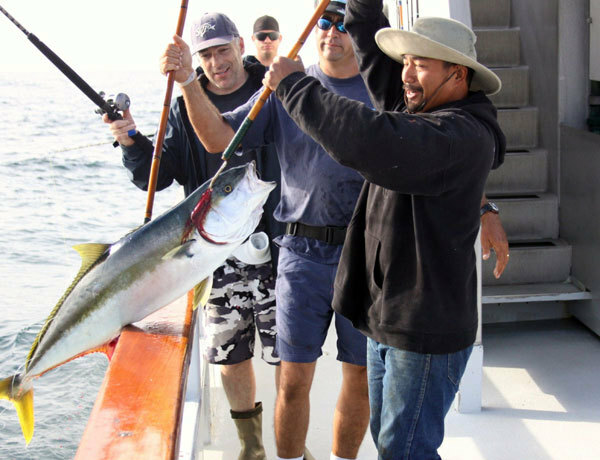 The trip promises to be a lot of fun, with some chances at larger tuna in the 50 to 100-pound range; either bluefin or yellowfin, depending on what's biting. 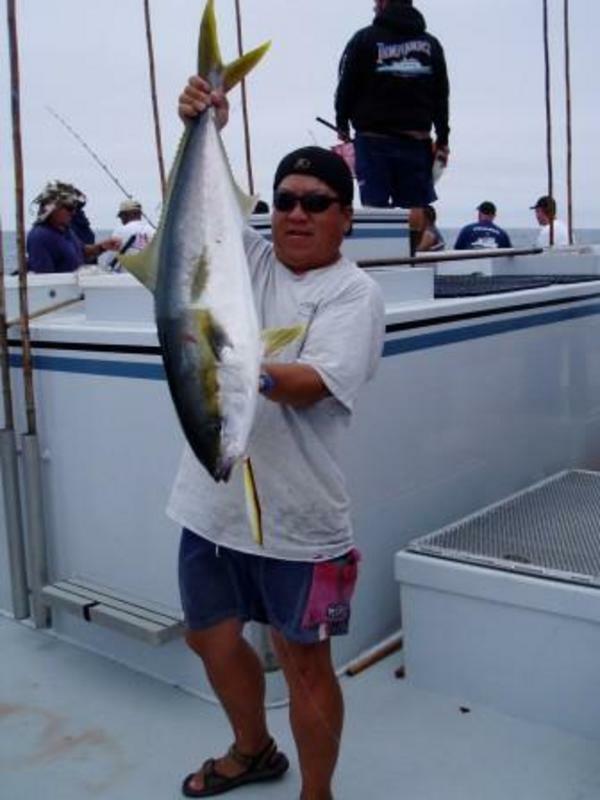 Bigger yellowtail are probably a given. A plethora of prizes and goodies for all will be distributed by Bill Roecker And Paul Sweeney of FishingVideos.com, from sponsors like Accurate (a new reel), Zucker's, Salas, Calstar, Seaguar, Catchy Tackle, Mustad, AA's, Izorline, Peter J, and other sponsors of Bill's Sportfishing Calendar and book At The Rail: Long Range Fishing. 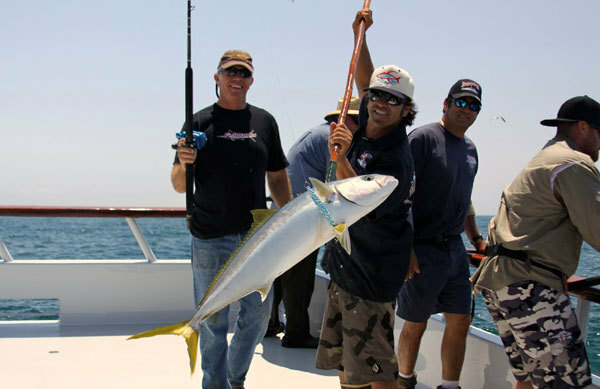 The trip will be shot in hi-definition 1080 P video on Bill's professional gear, and a DVD will be made of the underwater and on deck action with comments by the skippers and crew and anglers. All anglers will get a free copy and a bag of prizes in exchange for a signed video release. With big fish biting in three or four hotspots already, this trip promises to be one of the season's best summer adventures. Call the Indy office, and jump aboard to fish with Bill! Hello from the Indy, Sorry for the lack of reports, somehow our e-mails did not go through for unknown reasons. 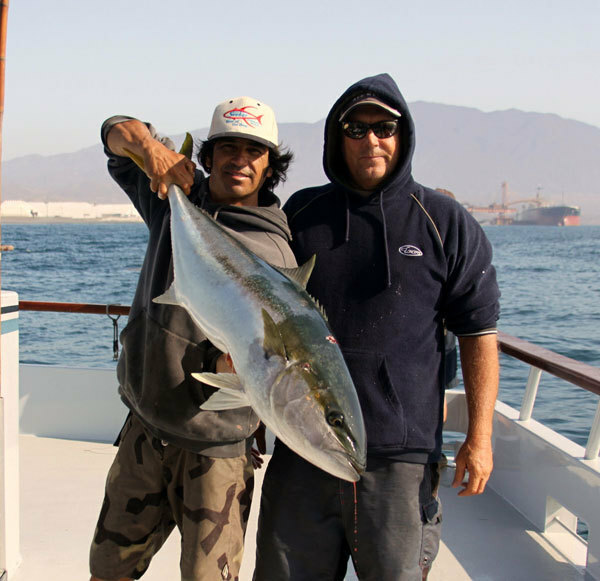 We have been looking for that better grade yellowfin that our fellow long rangers had just days before us and came up empty, The good water the fish had been in, broke up and all we found in the area was off color water and very little life. We did catch about 50 school size tuna in 12 to 22 lb. range with a few in the 25 to 30 lb. range. Late in the day we hit a spot to finish up on the yellowtail portion of the trip also. Tomorrow is more or less a travel day with about a half day to spend fishing the coast. The weather has been up a bit with 15 to 22 knots the last couple of days, it is getting better all the time as we travel north, Thanks for checking in, Mark and the Indy Guys. south, remember in some areas it will be closed due to maintenance. 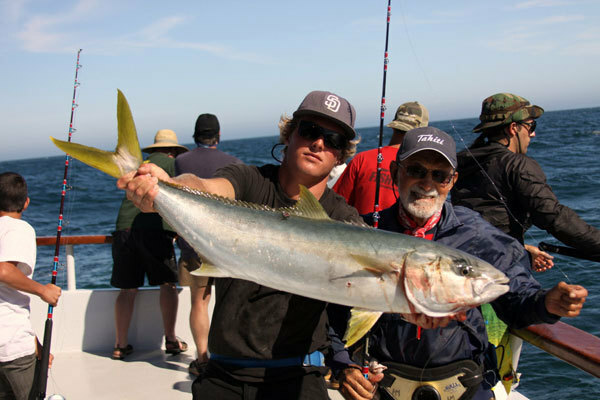 "Today we had very good fishing on nice yellowtail," wrote owner-skipper Mark Pisano aboard his Independence July 12. "The afternoon started slow but built through the evening hours to a wide-open bite on 18 to 30-pound fish with a 55-pounder topping the day. 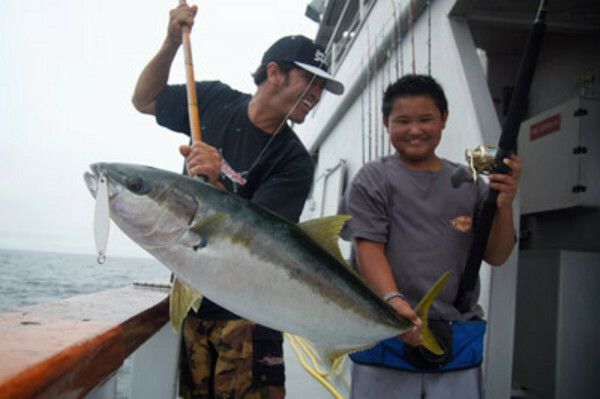 With our yellowtail fix in, we plan to try for tuna tomorrow. The weather is good with just a light breeze to keep it cool. Thanks for checking in and wish us luck." Today was spent in warm weather and calm seas and the gang on board really had a relaxing day. We opted to fish the coast for bass and hoping for a sea bass or two. 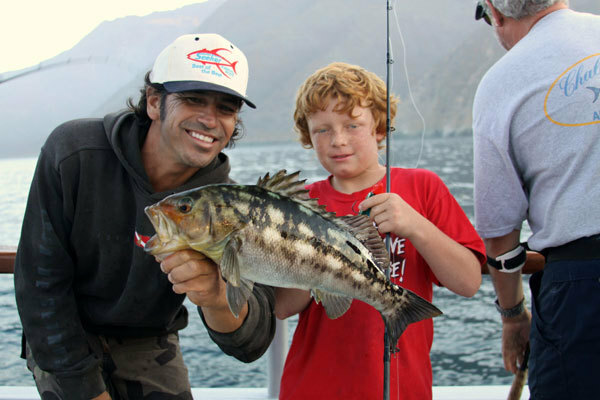 The Calico fishing was wide open with fish up to eight pounds and lots in the 3 to 6 pound range, most were released and some kept for a meal or two. Bonus fish came in the form of 36 to 55 lb. yellows that put on a great surface show and bit the surface Iron and fly-line dine. We are headed up in fair weather and plan to travel most of the day and may fish if time permits. Have a great day, The Indy crew. ETA for 7/16 could possibly be 7am. We returned today from ouur 7 day Tahoe tuna trip, We want to thank everyone onboard this year and hope to see you soon. 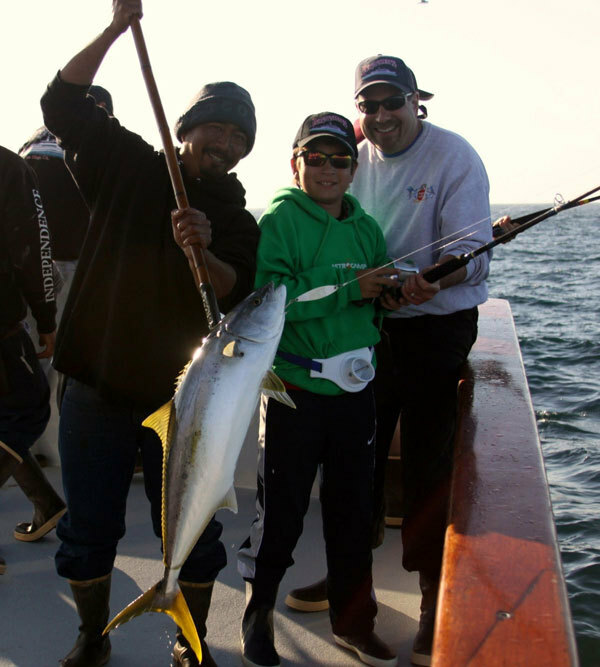 The Jackpot winners were as follows: Zackary Mouawad With a 38.2 yellowtail and Woody Preston with two 35.6 and 35.0 yellows for 2nd and 3rd place. 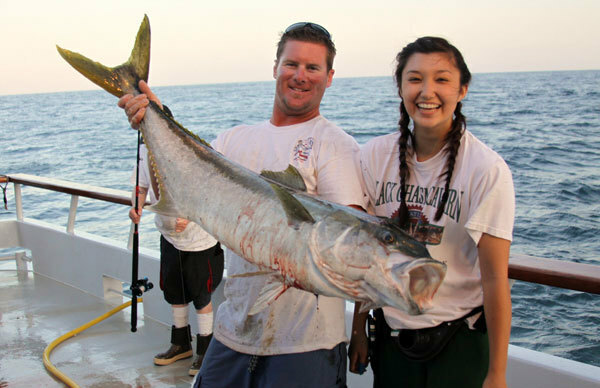 Big fish for the trip went to Samual Lu with a 42.0 yellowtail and young 16 year old Christine Kubota with her 38.8 yellow. Good job everyone, Next years trip will be in August and the 2012 trips our now on the schedule page. "Today we arrived in the morning," said the report from skipper Jeff DeBuys of the Independence July 18, "and got busy almost as soon as we got the anchor down. 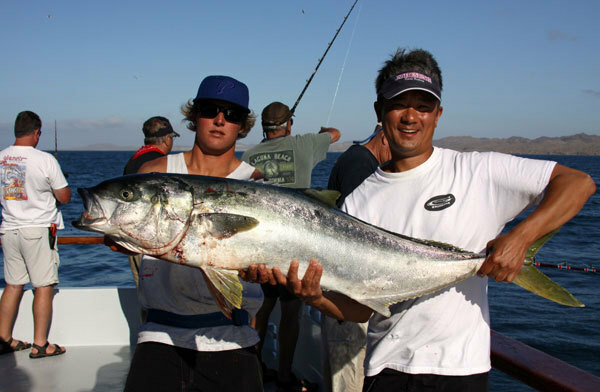 There were some slow times through out the day, but all said and done, we had a good day on tuna up to 85 pounds and yellowtail, with two fish in the 50 to 60-pound range, and the rest good grade Alijos-brand YT. The weather is good, and we plan on another good day here tomorrow." "Today reminded me of yesterday," wrote skipper Jeff DeBuys aboard the Independence July 20, "in the way that it was really busy from day light until lunch time, and then slow for a couple of hours. 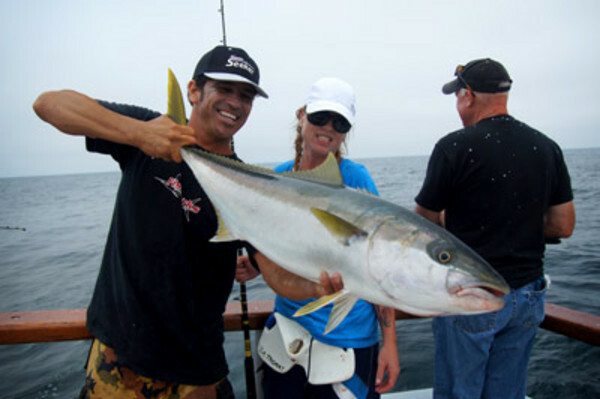 Good tuna fishing, and great yellowtail fishing. We are currently on the way up to try for some more yellows tomorrow, gaining altitude all the time. The weather is great for now, and we hope it stays this way." The Ridge has been good! We wanted to fish at the Rocks but the weather was up due to the Tropical Storm South of us. 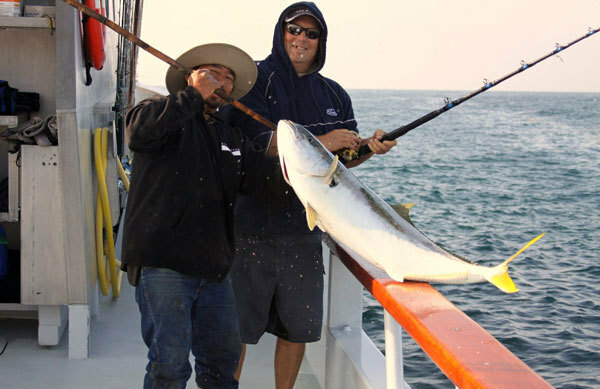 We opted for the Ridge and we have had very good fishing for Yellowtail. We will be posting some pictures soon. 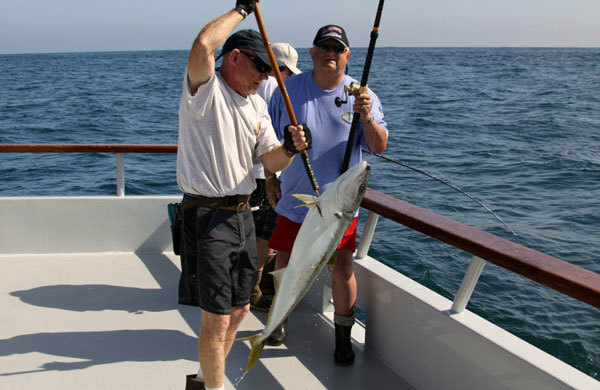 On our way back we will be stopping by the Bluefin area to try our luck. Please call Judy Immediately with your Passport number and expiration date.. Passports are MANDATORY! Today we fished offshore looking for tuna kelps; we did find a lot of nice kelp Paddy's during our 80 miles searching and found two that had a good amount of fish on them. 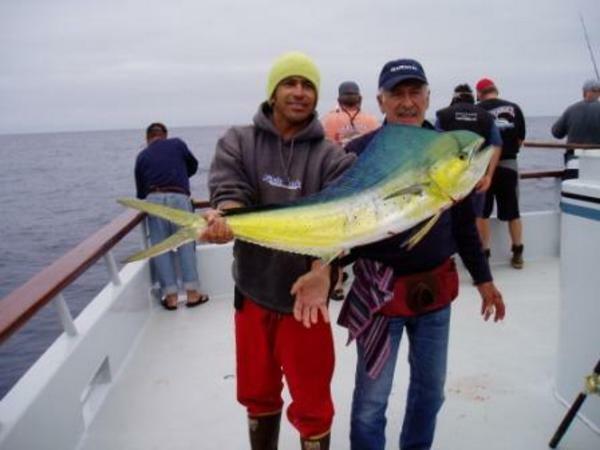 The first had full speed yellowtail, which we released as we have plenty of yellowtail already, the second had Dorado that bit well and the result was daily limits of Dorado off that kelp. The weather again was flat all day long and looks to continue until the weekend. Tomorrow we plan to work north looking for tuna, wish us luck the Indy crew. Hello from the Captains, we want to make everyone aware of new mexican requirements to have passports on all trips that fish 12 miles from shore south of Ensanada. We can't say which trips will do this as fishing options change daily, all passengers must have a passport to board the boat. Please call Judy with your PP # ASAP. Thank You for understanding as this was a big surprise to us as well. We are in the process of getting clarification from Mexican officials on this issue so check back for updates. Thank you, the Indy guys. Bill Roecker and Paul Sweeney shooting a new DVD. We also want to sent out a big thanks out to Bill and Paul as well as the sponsors for the Great giveaways Bill passed out during the trip, Aftco products, Accurate reels, Seeker rods, Cal Star rods, Izorline, Salas jigs, Tony Paino from AA plastics, Zuker lures, Seaguar fluorocarbon, Catchy tackle and Mustad hooks. Jackpot winners were as follows: Tim Esposito 31.2 yelowtail, Michael Giardino, 28.6 yelowtail and Michael Olson 27.2 yellowtail. 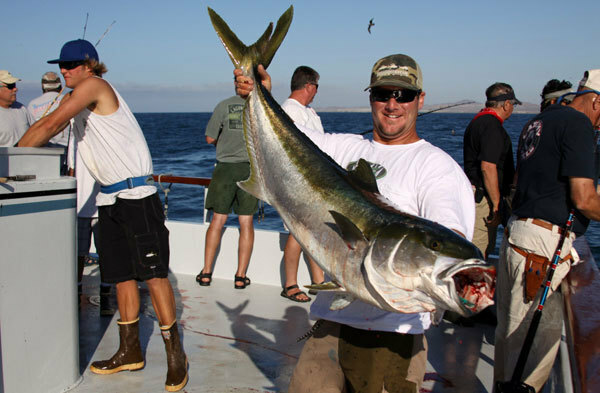 Totals for the trip were 435 yellowtail, 16 yellowfin tuna and 76 dorado. Next years trip will be a seven day trip departing july 21st 2012 and we have 8 spots available. Thanks for checking in. The Indy staff.